This lead me to experiment with different thresholds for switching between binary searches and linear scans. Again to my surprise, for the integer tests done by the speed test, binary search was never faster for 256 bytes nodes (64 integers, the default the library picked). Linear scanning was always quicker for these small nodes, even though a single cache line is only 64 bytes. 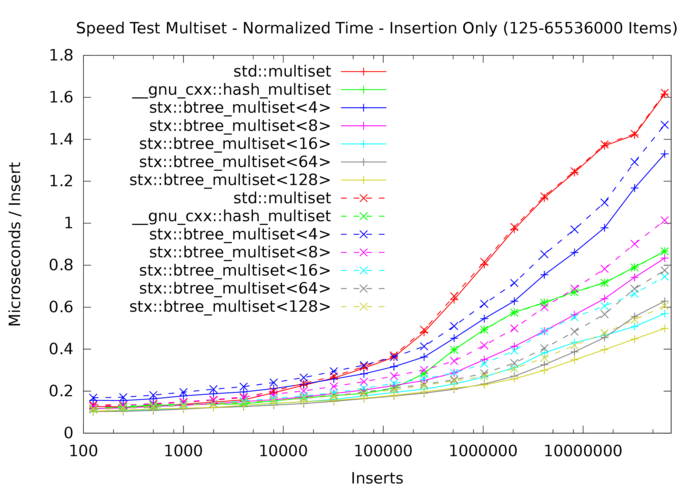 Some further testing verified that indeed 256 bytes seems to be a sweet spot. Thus I completely replaced the binary search in STX B+ Tree with a linear scan for all nodes up to 256 bytes. See below for the speed boost this gave. However, that is not the whole story. Of course, the tree must still be usable with other keys than integers! In the default configuration, the library will try to create nodes of 256 bytes size, packing as many keys as necessary. For very large keys, however, at least 8 key items will be put into a node. For these configurations, the tree will still use binary search. The same must be done if the comparison function is slow, as linear search has O(n) complexity where binary search does only O(log n) comparisons. For such occasions, the library exports a setting binsearch_threshold in the traits class, which can also be set to zero. For more information, click on the plot above or download the whole result data. The linear scan patch will be included in the next release of STX B+ Tree, which is due any day.